Cameroon have shaken up their squad for November's friendly against Albania. Coach Jean-Paul Akono was criticised for selecting older players as Cameroon lost to Cape Verde in their Africa Cup of Nations qualifier in October. He has responded to that disappointment by dropping goalkeeper Idriss Carlos Kameni, defender Stephane Mbia and striker Idrissou Mohammadou. Jean Paul Yontcha and Gilles Ngomo have been called up to the Indomitable Lions squad for the first time. At 29-years-old, Yontcha (pictured) has been given an opportunity late in his career. 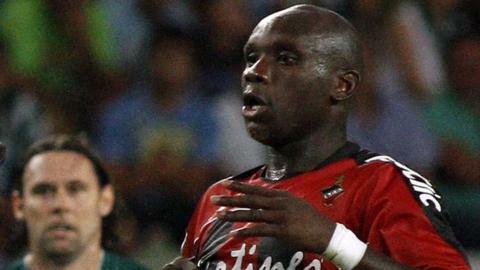 The striker, who plays for S.C. Olhanense in Portugal, has been brought in to boost an attack that faltered against Cape Verde. Mohammadou was one of the major disappointments in the second leg of the Nations Cup final-round qualifier, which Cape Verde won 3-2 on aggregate, and has paid the price for his ineffective performance - a display that drew jeers from Cameroon fans. Veteran keeper Kameni, who has languished on the bench for his club Malaga this season, was also poor in that match and makes way. However, some players may consider themselves unlucky to have been overlooked for the match against Albania in Geneva on 14 November, having not been given a chance to show their worth. William Overtoom of Heracles Almelo was first called up on 15 March but has twice been a substitute and did not feature against Cape Verde - despite training with the Cameroon squad in the week beforehand. Other players like Allain Junior Olle Olle, Modeste Mbami and Aurelien Chedjou have been similiary discarded. It is up front that Akono has made the most changes, bringing in 28-year-old FC Randers forward Pierre Boya and CS Constantine front man Gilles Ngomo, 25, and 26-year-old Andongcho Matthew Mbouta, as well as Yontcha. Mbouta is included in the squad even though he is currently without a club after leaving Swedish side Syrianska FC. Franck Song'o of Portland Timbers in the United States earns his first call-up for a year and Montpelier defender Henri Bedimo returns after recovering from the injury that stopped him from playing against Cape Verde. Forwards: Vincent Aboubakar (Valenciennes), Mathew Mbuta Adongcho (unattached), Joel Babanda (Union Douala), Pierre Boya (Randers), Samuel Eto'o (Anzhi Makhachkala), Fabrice Olinga (Malaga), Achille Webo (Buyuksehir Bld. Spor), Jean Paul Yontcha (Olhanense).